Discussing Cuba By Liz Lochhead. 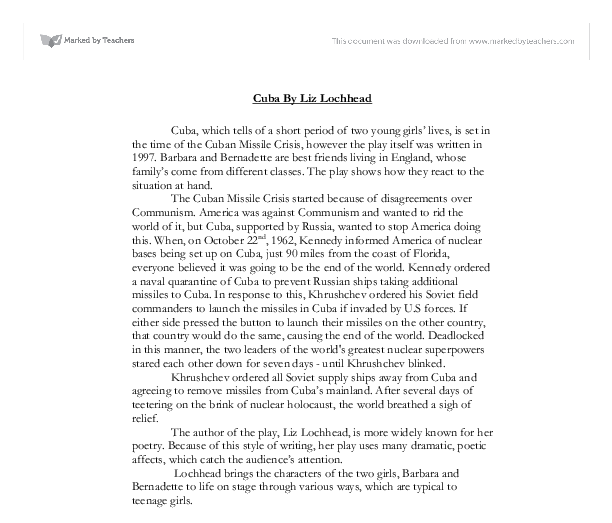 Cuba By Liz Lochhead Cuba, which tells of a short period of two young girls' lives, is set in the time of the Cuban Missile Crisis, however the play itself was written in 1997. Barbara and Bernadette are best friends living in England, whose family's come from different classes. The play shows how they react to the situation at hand. The Cuban Missile Crisis started because of disagreements over Communism. America was against Communism and wanted to rid the world of it, but Cuba, supported by Russia, wanted to stop America doing this. 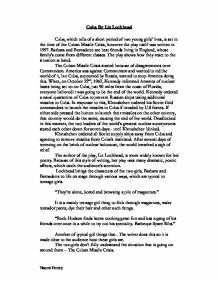 When, on October 22nd, 1962, Kennedy informed America of nuclear bases being set up on Cuba, just 90 miles from the coast of Florida, everyone believed it was going to be the end of the world. Kennedy ordered a naval quarantine of Cuba to prevent Russian ships taking additional missiles to Cuba. In response to this, Khrushchev ordered his Soviet field commanders to launch the missiles in Cuba if invaded by U.S forces. If either side pressed the button to launch their missiles on the other country, that country would do the same, causing the end of the world. Deadlocked in this manner, the two leaders of the world's greatest nuclear superpowers stared each other down for seven days - until Khrushchev blinked. ...read more. The Chorus repeat the family's homilies. "Chorus To whiten grubby elbows, rub with a cut lemon, daily." In this part, the Chorus become the voice of the magazine "Chorus Your fortune in the cards A Queen for a lady, A King for a gentleman The suit according to his colouring - Hearts if very fair..." The fortune-telling book is read by the voice of the Chorus. "Chorus ...The purpose of these bases can be none other than to provide a nuclear strike capability against the west..." The radio is the sound of the Chorus's voice "Chorus Hobgoblin nor foul fiend Can daunt his spirit; He knows he at the end Shall life inherit." Here, the Chorus read out a prayer in assembly. There are also more places where the Chorus take part in the play. All the above quotes are proof that the Chorus has been modernised by Lochhead to fit the play. However, she manages to use the people that make up the Chorus as characters, too. "...all the girls in the Chorus become a classroom seated in pairs, Barbara and Bernadette in the middle." This shows how Lochhead is creative with her characters, using them for more than just one function, making the play more interesting and creating a variety of sound textures to the play. ...read more. Her crush on him also breaks. The tension of the Cuban Missile Crisis has been building up. All the characters onstage would have been thinking 'Is the world going to end?' But when Khrushchev gives in, the tension breaks. All three storylines all have a moment when tension is caused. In Barbara's highly emotional speech about the horse in Nagasaki, she is in Mr Shaw's class and part of her reason for crying is because Mr Shaw is going to marry Miss Arthur. When the naval quarantine is announced on the radio by the Chorus, the tension is very high. This, unlike the other two stories' build up of tension, is early on in the play, where as the others are nearer the end. For Barbara and Bernadette's friendship, the build up is at the end when they're waiting for the conclusion of the graffiti. This play, full of variety of text and rhythms is difficult not to admire. The information it gives adds to the wonderful poetic writing Lochhead has given us. Because it was written so well, the audience bonds with the characters. They want certain things to happen to them and they get an understanding of how the characters are feeling during the performance. The play doesn't lack in keeping the audience entertained, mainly because of Lochhead's many language techniques and the use of characters. Lochhead has broken new ground purposely to entertain us. Naomi Finney ...read more. Stanhope relates differently with different people. In this play there are not two people he connects with in the same way. Stanhope's relationship with Mason is either purely work related or quite humorous which adds a light relief to the play. Film Noir was shaped by the experience of war's horrors, by the deep-rooted anxieties touched off by the dawn of the nuclear age, and by the difficult post-war adjustments faced by thousands of returning veterans. Other films of 1946 "My Darling Clementine", in this classic western John Ford employs many of the styles used in Film Noir. themselves; no one knows where they are going and More seems to be in the middle of it all as the waters are rising. Bolt reintroduces the family because they are an important part of the play; they each represent a part of More's emotions. In drama we distanced the characters from the narrators to show there was tension between them. After we brought them together to show they had joined together. This was the same in dance, however we spaced out heaven to show the was a break and that is how hell gets through and destroys heaven. She also uses fashion collocates 'mix and match' which grabs attention and adds interest to the description of the product. Line 48-49: 'it means that we can choose styles and designs' Again in this utterance she use collocates 'styles and designs' associated with fashion. staff changes their minds and thinks that euthanasia is the right option to choose then there must be some degree of truth in it, as audiences thirty years ago were easily persuaded by the opinions of the professionals, such as Doctors.